When 2016 started, I celebrated my 27th birthday - my golden birthday (27 on the 27th of January). Shortly after, Megan and I celebrated our one year anniversary on March 1 as the co-owners of Darling. Shortly after, in late Spring, a season of transition began with Megan's bittersweet decision to depart from Darling, ushering me into a season of unknowns as I stepped into the new role of sole owner, but also a season of increased faith and surprise blessings. 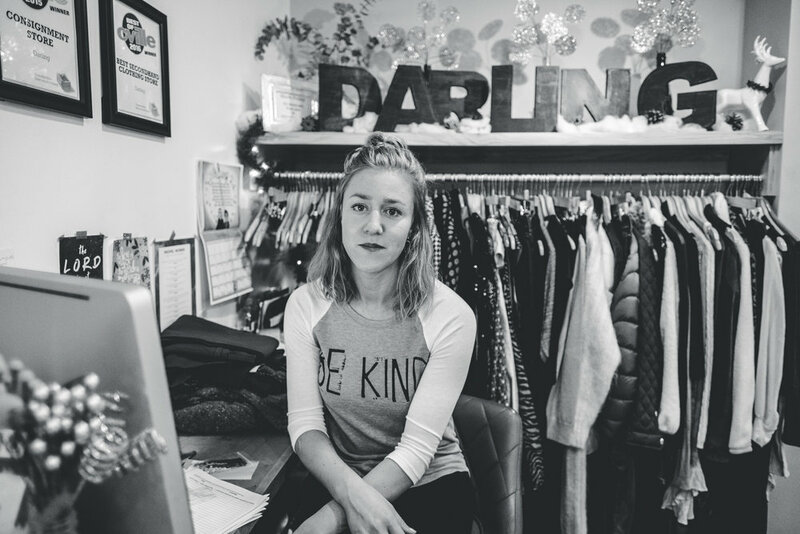 Darling Boutique now hosts over 20 local artisans, adding more than a dozen new artisans this Fall to bring you a variety of locally made goods in addition to the curated consignment! The shop won Best of C-VILLE for a 2nd consecutive year for Best Consignment Shop, thanks to our incredible community! This year has been filled with many fun collaborations with talented locals for pop ups and photo shoots (shout out to photographer and friend Tristan Williams for joining forces with me!). I've even gone through not one but two hair makeovers (and another one on the way!). Darling was even featured in a little promo commercial for The Momentum Agency, which you can watch right here! Look at those darling models werk! I've made new friends with customers and consignors, and loved seeing familiar faces return again and again. 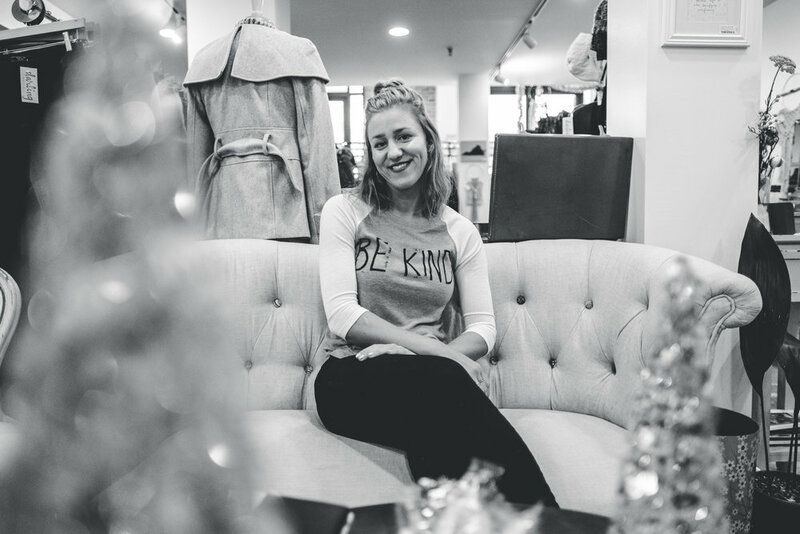 I've seen God's hand over this little shop through divine appointments with women, and through divine provision, bringing me not one, but three darling gals to work part time in the shop through the holiday season (shout out to Meredyth, Kerrie, and Autumn!). But being a lady boss isn't all smiles and pretty photo shoots. Running a shop isn't always fun, and it certainly isn't always easy. I have been tested this season in ways I struggle to even express - and in many ways, wasn't ready to share. But part of this year's immense growth has been possible because of renewed vulnerability and humility. So, here it goes. Personally, this year was filled with emotional chaos and challenges, of physical injuries and battles with my health, relationships torn apart and mended back together. I cried (til it hurt). I laughed (til I peed). I danced (to process, to express). I cursed (more than I'd like to admit). I prayed (without ceasing). I praised (more than I ever have). At times I felt surrounded by mess, I felt like I couldn't breathe. And, other times, I felt like I couldn't breathe enough, like the expanse of God's beautiful world couldn't be inhaled deeply enough. This year was a rollercoaster - thrilling highs and terrifying lows. I worked many 12-14 hours days at the shop over the past months, and was faced with new challenges as I took on more responsibilities - all while trying to grow the business each month. I was cranky, snappy, and ugly at times. I know I was. A few weeks ago, in November, I even experienced my first anxiety attack, crumbling under the weights I was carrying, the worry I was akin to. I haven't know how to talk about it much with anyone since, but I know this: In a moment of physical fear, I was met with overwhelming physical peace. I was met with grace. I have learned much about myself these past few months - the good, the bad, the ugly. But I've also learned much about grace, about faithfulness, about trust, and about patience. I've learned much about my incredibly heavenly Father who loves me beyond measure. God's a really, really good teacher. Through all the hurt, through all the mess, through all the imperfect moments, He has been working, speaking, loving, and teaching. He's been pruning, whittling, stripping me of parts of me, only to reveal His glory - and my need for Him in this journey. Amidst my many foolish attempts to self-sustain my energy, health, and sanity, the Lord met me with grace, peace, and wisdom. When I felt isolated and alone in this venture, He surrounded me with community, with emotional, spiritual, mental, physical, and financial support. The more I surrendered, the more He provided. The more I let go, the more He gave. Continual surrender. That's 2016 in two words for me. This year has been a crazy ride, full of surprises, mountains to climb, valleys to sit in, rest in, and stay ready in, faith to grow in, and lots and lots and lots of grace. He's met me each and every day in this crazy year, and I sit in awe of His unwavering love, His steadfast character. I am learning to steward what I have been given from the Great Teacher. And I hope I never stop learning. These are just a few of the verses and quotes posted behind the counter for me to look at daily. I put them there (because I'm a visual person and) because some days I need reminders of the joy, goodness, faithfulness, strength, abundance, peace, grace, hope, and beauty found in Him - my fountain, my well. Be encouraged, darling, take heart, for the Lord is at hand, ever near, ever present in your life. No circumstance can change that. Ever. I'm still so thankful every day for this little shop, and for how God brought me to this exact place, this space. I find myself standing in the shop some days, in awe, filled with joy, or peace, or gratitude. It is humbling to know how much so many people have put into this business over the last two years (almost! ), and who continues to do so day in and day out. I am not alone in this, not at all, not ever. I am backed by a community, near and far, deep in their love and grace, wide in their willing hands and feet. And, most importantly, I am partnering with the Lord Almighty in His vision for my life, for this shop. This is His shop, and I am here to steward it - with His help. And that's freaking cool. I was asked countless times this year how the shop is going, or how I'm doing, and for months, I kept saying, "I'm tired, but good." As of recent, I've decided it's time to change my words, for they have power, and I'm done being tired. Sure, this business ownership this isn't a joke, and it is certainly exhausting work. But I was created for this purpose, I was molded into this woman, for this shop, and I am confident in the Lord's hand over my life. I will not grow weary, I will run this race with perseverance, fixing my eyes on Hope (a person, not an outcome, not a resolution). It's time to start joyfully saying, "God is good! So I am good, the shop is good, and I am incredibly blessed." So, here we are, darlings, looking boldly at 2017. As someone spoke prophetically over me this Fall, I am an arrow, steady and ready in the bow, to be sent out again and again, hitting the target each time - a straight shot. The momentum is continuous, it never stops, it will return - cyclical in its path. Of course, it is the Lord that keeps me steady and straight, and, oh, how I yearn to be steadfast in the bow, to stay ready for what He may have for me in this next year, for where He may send me. I am ready. Today and every day, I choose to be love, to live love, to speak love. To do justice. To love kindness. To walk humbly. I want to be quick to listen, slow to speak, and slow to anger. There is no room for fear in love, no place for hate in kindness, in joy. Burn on, for love is the final fight. Hope is a person, not a resolution, not an outcome. And He is enough. Every day, every year, come what may, Jesus is reason enough to hope. Take courage, dear heart. Stay steadfast, my soul. 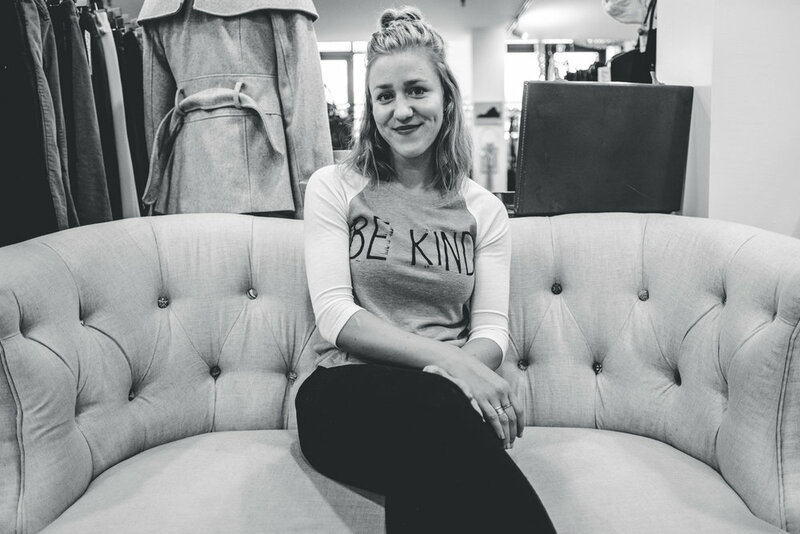 Big thanks to Tristan Williams for capturing these shots of me in the shop a few weeks ago - the good, the bad, the reality of running a boutique.